What does angular resolution measure? 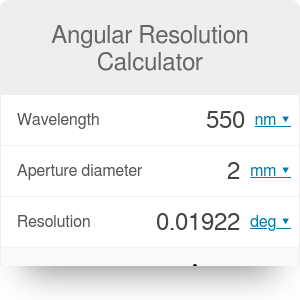 Angular resolution calculator can assist you in determining the angular resolution of a lens - the ability of an instrument to distinguish small details of an object. What does the angular resolution measure? What is resolution in microscopy? Read on to find answers to these questions and learn about the angular resolution formula. distinguish between very distant objects that seem to be close to each other. The smaller the angular resolution is, the more details you can see. It is essential when designing microscopes, telescopes, or cameras. Even the human eye has its angular resolution! d is the diameter of the lens aperture. The above formula was derived for diffraction grating, but it can be used for other purposes too. Lord Rayleigh stated that two light sources are regarded as resolved when the principal diffraction maximum of one image coincides with the first minimum of the other. The diameter of an eye pupil (our natural lens) changes during the day and night, but it is approximately 2 mm on sunny days and 8 mm at nights. Let's assume that we will try to resolve points which are green; the wavelength of green light is equal to λ ≈ 550 nm. With Angular resolution calculator we compute that the angular resolution during the day is θ ≈ 0.02°. We can compare this result with the Hubble space telescope which has a mirror of diameter 2.4 m (it collects light just like the eye pupil). The estimated angular resolution equals θ ≈ 0.000016° - it is 125 times better than our eye! Angular Resolution Calculator can be embedded on your website to enrich the content you wrote and make it easier for your visitors to understand your message.